Out on a Limb Tree specializes in Tree Removal, Stump Grinding, Tree Trimming, Tree Pruning, Tree Shaping, Tree Thinning, and Tree Crown Reduction. They are knowledgeable about the needs of trees and are trained and equipped to provide proper care. Proper tree care is an investment that can lead to substantial returns. Well cared-for trees are attractive and can add considerable value to your property. Poorly maintained trees can be a significant liability. Pruning or removing trees, especially large trees, can be dangerous work. Tree work should be done only by those trained and equipped to work safely in trees. 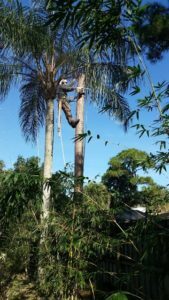 Out on a Limb provides many of these Tree Services and you will never have to worry about clean-up. We leave every site immaculate. Out on a Limb was started in 1999 by Jason Moore. Jason has a wealth of knowledge and experience in bringing out the best in tree shaping and design. With Jason’s knowledge, you can count on OUT ON A LIMB to take care of your trees at a reasonable price. Jason and his crew did an amazing job! My yard looks so much better than it did. Would def use them again! Jason and his crew did a great job. They were timely, neat, and very professional. Jason and his team are courteous, quick and do a perfect job.